South Africa is a country of contrasts as can be seen by the colours of its tribes, by its battles and conquests, its savannahs and deserts, its ocean and mountains and its flora and fauna. It is a country so rich in a history of diversity that it was named the “South Africa Rainbow Nation”. This title refers to the incredible diversity of its people, languages, religions and cultures. There is hardly a nation on Earth that is not in some way represented in the heritage of this country: from the slaves who came from Indonesia, Madagascar, India and Malaysia to the Africans, Americans, Europeans and Asians who arrived after the discovery of mineral wealth. The original inhabitants were the San Bushmen. Later, black migrants from sub-Saharan Africa settled in the area, followed by the Khoisan, the Sotho, the Zulu, Xhosa and the Tswana. The Dutch arrived in 1652 bringing slaves from the East Indies and were soon followed by the British, French and Germans in the latter part of the 18th century. When the Dutch arrived and settled, their language and culture became mixed with the locals eventually creating the language now known as Afrikaans, a mixture of old Dutch from the south of Holland that incorporates words from the languages of Indonesia and Madagascar. The mixed population is known as “Afrikaner”. The ‘Cape Coloured’ is the population born from the union of European settlers and the Dutch slaves from India, Madagascar, Malaysia, and other countries of the East Indies. For nearly 350 years South African history was one of clashes and racial oppression. But all of that started to change with the first democratic elections in 1994 resulting in Nelson Mandela leading the “New Nation” of a population known as the people of the Rainbow Nation. Today South Africa has a new constitution that provides the legal foundation for the existence of the republic and defines the rights and duties of its citizens; nonetheless, poverty and inequality remain widespread. This being said, the population of South Africa is strong and tough and is looking for ways to move its population out of poverty, as can be seen in the tourism and hospitality sectors, where people who work, offer incredible service with the hope of increasing the number of visitors to the country each year thus creating more jobs. The western Cape is a province of South Africa in the south western part of the country. It hosts the legislative capital of the Country, Cape Town, one of the most multicultural cities in the world and the most fascinating of South Africa. Overlooking the city, Table Mountain (1080m high) is a big tourist attraction with many visitors using the cableway or hiking to the top. 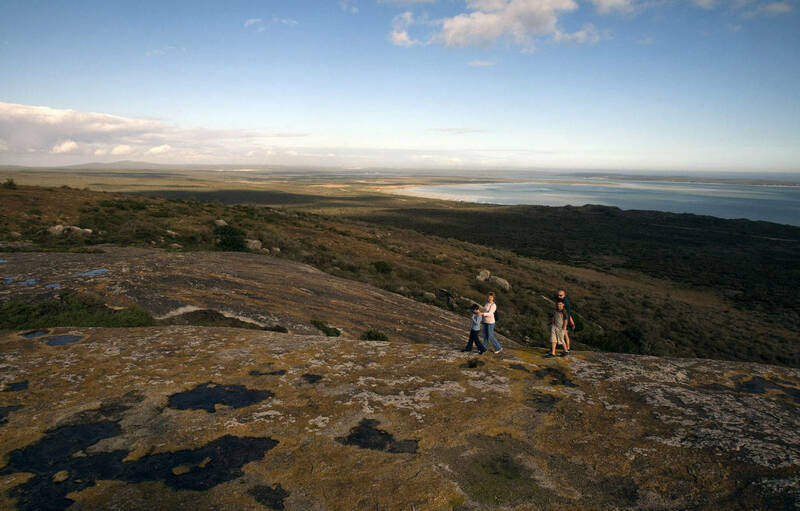 The main feature of this mountain is the level plateau bordered all around by impressive cliffs from which visitors can enjoy the stunning view of Cape Town and the Bay. The city is very well positioned between the mountains and the ocean, lying just southwest of the vineyard territory. This surrounding territory boasts some of the most majestic landscapes in the country: beautiful backdrops of mountains and hills laced with grapevines, where the finest wines of South Africa are made. There are many other small towns of interest n the Western Cape region: Stellenbosch, for example is considered the capital of South African wine production and is where the first wine route was opened in 1971. Franschhoek (the French corner), founded by the French and situated in a beautiful valley that has perfect soils for grape vines, is one of the oldest towns of South Africa. Paarl is the largest town in the Cape wine grape-growing area and is renowned for viticulture, oil and cheese production. 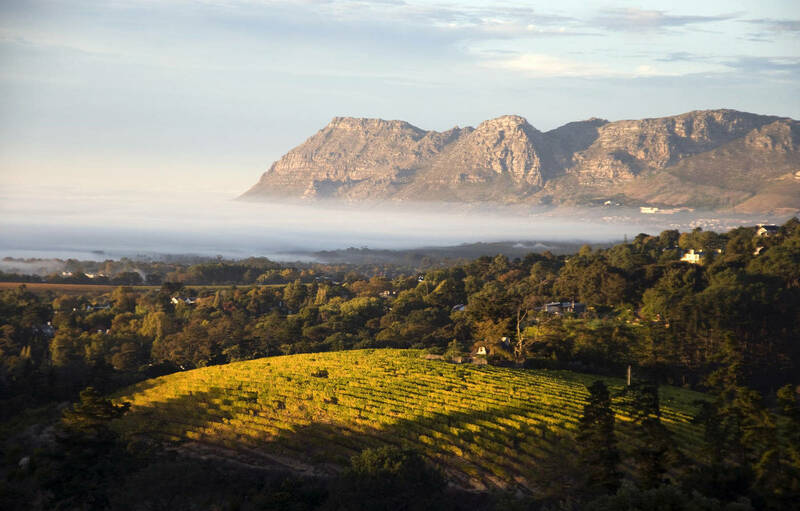 Constantia Wine Route, only 15 minutes from Cape Town, is a spectacular experience for the wine lover. It is an escape from the city into a magnificent mountain countryside that produces a wide range of premium world class wines. Finally , there is the famous Route 62, the longest wine route in the world. An area of magnificent landscapes, towering cliffs, streams and an abundance of trees passing through small towns such as Oudtshoorn, Langkloof, Barrydale, Montagu, Ashton, Robertson and Ceres just to name a few. These easily accessible towns nestled along the valley offer ample opportunity for discovery. From winery visits, game reserves, tribal art and museums to more adventurous experiences such as mountain climbing, canoeing and fishing; all the visitor has to do is choose the experience that fits his taste. The Cape of Good Hope is a must see for any traveller as are the beautiful Kirstenbosch gardens, where there are more than 5000 plant species are conserved. The Western Cape province has an incredible variety of landscapes, with more than 1000 kilometres of beautiful beaches along the Garden Route. This name comes from the ecologically diverse and lush vegetation encountered here and along the numerous lagoons and lakes that dot the coast. There is a thriving artistic community as numerous artists have been inspired by this area and its landscapes, many even making it their residence. The main attraction of this province is the Tsitsikamma forest, a protected area on the Garden Route. It is a coastal reserve well known for its indigenous forests, dramatic coastlines and the Otter Trail. Another interesting place to visit is the Fruit Route, where you can enjoy the beautiful colours of the fruit trees flowering in the spring. The wild coast is the region that stretches from East London in the south to the boarder of KwaZulu Natal in the north. The name comes from the incredibly wild and beautiful beaches along the coast, the massive cliffs, and waterfall bluffs that leap over the rocky crags into the surf below. The Karoo offers quite the contrast to these areas; it is a semi-desert natural region with many walking trails for excursionists and is home to Mount Zebra National Park. Another important National Park in the area is Addo Elephant Park which has recently expanded in order to conserve the biodiversity of flora and fauna over a wide range landscapes. The park is the only national park in the world that hosts the “big 7”: elephant, lion, leopard, rhino, and buffalo, who form the terrestrial “big 5” plus the southern right whale and the great white shark. 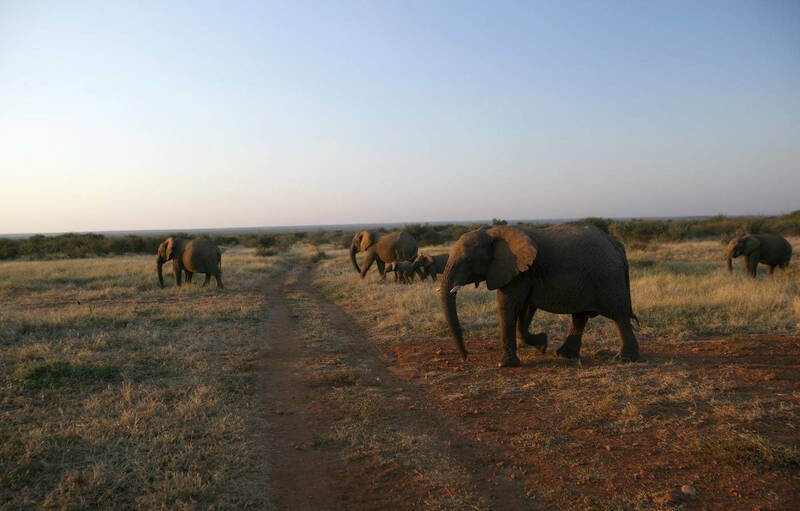 Addo was founded in 1931 in order to provide a sanctuary for the eleven remaining elephants in the area at the time. Today the park hosts more than 600 elephants and a large number of other mammals such as zebra, rhino, hyena and antelope and stretches over 180.000 hectares from the Sunday River Valley down to the Ocean. Durban, the largest city of KwaZulu Natal, is highly diverse with a cultural richness that is the direct result of the mixing of various ethnic traditions and beliefs. Zulus form the largest single ethnic group followed by a mix between Zulu and Indians creating a multiethnic and very interesting city. The coast offers beautiful cities, bays and dune forests while the northern part has managed to retain more of its savageness. Three hours northeast of Durban, in Zululand lies a collection of game parks and nature reserves. One of these, the Hluhluwe-Umfolozi Game Reserve, is well known for bringing back the white rhino from the brink of extinction. It is also home to lions, elephants, giraffes, leopards, buffalos, gnus, kudu, springboks and other species. From the reserve, it is easy to access St.Lucia Greater Wetland Park, which is part of the iSimangaliso Wetland Park, an enormous estuary where crocodiles, hippos, and sharks all share the same waters. The iSimangaliso Park was the first World Heritage Site in South Africa due to its rich biodiversity, unique ecosystems and natural beauty. The Ukhahlamba-Drakensberg Park is another World Heritage Site and is part of a much longer mountain chain that stretches 1.600 km from south to north along the border between South Africa and Lesotho. Mpumalanga, “where the sun rises”, is South Africa’s wildest and most exciting province and, of course, the most visited. The area is divided in two: the Drakensberg Escarpment and the low veldt of the Kruger National Park.The Drakensberg Escarpment rises to the west of Kruger and provides a marked contrast to the low veldt. It is a beautiful mountainous area full of trout streams and waterfalls, endless views and giant plantations of pine and eucalyptus. The Kruger National Park spans across diverse terrains ranging from rivers filled with crocodiles and hippos to rocky outcrops. In this area you can visit the Blyde River Canyon, a 25 km long canyon of mostly red sandstone that is 750 m deep. To best enjoy this landscape, it is recommended to take the Panorama Route. In fact, travelling along this road you can see looming rock formations, plummeting waterfalls and panoramic mountain views as well as many quaint towns along the way. Route Highlights include God’s Window, one of the most breathtaking viewpoints; the Bourke’s Luck Potholes, a moon-like geological feature consisting of large, cylinder-shaped potholes in the rocky bed of the Blyde River; and the three Rondavels, which are three huge quartzite and shale rock formations. This route offers a wealth of activities as well, anything from poking around cultural villages and hiking on mountain trails to driving through game reserves, canoeing, water rafting, bungee jumping, horseback riding, quad touring and trekking. The towns of Lydenberg and White River are situated at the beginning of the Panorama Route together with other small towns like Sabie, Grasp, Orighstad,Hoedspruit and Hazyview. The most famous town in the area is Pilgrim’s Rest, protected as a provincial heritage site. The uniqueness of this historic village is vividly evident in its museums and historic sites, offering the visitor a fascinating window into the past, capturing the spirit of a bygone era and people in their quest for gold. This is the biggest park of South Africa and covers an area of 21.000 square kilometres. This is the best park for game viewing, boasting more than 500 species of bird, 114 of reptiles, nearly 150 mammal species (including The Big 5: elephant, lion, leopard, rhino and buffalo). There are 23.000 different species of plant! To the west and south of the Kruger National Park are the two South African Provinces of Limpopo and Mpumalanga. To the north of the park is Zimbabwe, and to the east is Mozambique. Kruger is now part of the great Limpopo Transfrontier Park, a peace park that links Kruger National Park with the Gonarezhou National Park in Zimbabwe and the Limpopo National Park in Mozambique. In the transfrontier park there are 2.600 kilometres of interconnecting roads, where tourists can drive freely as long as they respect the road rules and speed limits. The Kruger National Park has 21 rest camps as well as two private lodges and 15 designated private safari lodges, some with restaurants and swimming pools. Camping in the park has become popular with tourists, and it is possible to organise game drive safaris at night with expert guides. Situated in the high veldt, Gaunteng is the smallest province in South Africa; however, it is highly urbanized and contains the country’s largest city, Johannesburg, and the administrative capital, Pretoria. The Witwatersrand Gold Rush of 1886 led to the establishments of both Johannesburg and Pretoria. Johannesburg has become a modern, bustling metropolis that powers the country’s economy. Sandton is an affluent area of the city that offers malls, hotels and restaurants. Soweto (Soweto Western Township) is a huge urban centre where millions of people live. It is considered the ghetto of the “coloured people”; established in an area that once was only for “whites”, it is well worth a visit, although a guided tour is strongly recommended. Pretoria is more of an Afrikaner city than Johannesburg, and its bars and restaurants are less cosmopolitan. Pretoria was once at the heart of the apartheid regime; in fact, its very name is a symbol of oppression. Pretoria was named after the Voortrekker leader Adries Pretorious; the Voortrekker being Afrikaner emigrants who left the Cape Colony (British at the time but founded by the Dutch) and moved into the interior of what is now South Africa during the 1830s and 40s. This area is definitely worth a visit as it is incredibly rich in South African history. The Northern cape is the largest yet the most sparsely populated province of the country. Its deserts and semi-deserts (the Karoo, Kalahari, Namaqualand and the Richtersveld) stretch from the Orange River in the North to the Western Cape border in the south. The Orange river plays an important role in the South African economy, providing water for irrigation that sustains various farming activities as well as for hydroelectric power. The north is primarily Kalahari Desert, characterised by parallel red sand dunes and acacia tree dry savannah. The city of Upington is the perfect place to start a visit to the Kalahari. The desert is part of the Kgalagadi Transfrontier Park, extending for 34.390 square kilometers, most of which falls in South African territory. There is a diversity of mammal species in the area, such as antelope, black-maned lion, cheetah, hyena and wild cats. It is possible to stay overnight inside the park where there are a few rest camps featuring comfortable bungalows or camping sites. The Namaqualand is generally an semi-arid desert found south of the Orange River, but between August and October it suddenly transforms into an area covered in beautiful coloured flowers. These spring wild flowers are a well known local phenomenon that never ceases to amaze and delight those who are lucky enough to see it. This phenomenon is called “When the desert blooms”, and it is possible to experience it at its best in the Namaqua National Park, which is dedicated to the protection of this incredibly unique and wild but fragile ecosystem. The Las Vegas of South Africa, Sun City is about a two hour drive from Johannesburg. It is a huge entertainment complex including luxury resorts, casinos and a water park. There are two interesting parks to visit in this area: the Pilanesberg National Park and the Madikwe Game Reserve. The Pilanesberg National Park is situated in the ecologically rich area between the Kalahari and the low veldt. Open grassland, rocky crags, and densely forested gorges provide ideal habitats for a wide range of plain and woodland game, including the rare brown hyena, rhino, elephant, lion, cheetah, leopard, giraffe, zebra and 340 species of bird. The park was formed by a volcano that collapsed in on itself, leaving concentric rings of mountains. Nowadays, a dam lies at the centre of the range. There is a magnificent hide overlooking the dam, where plenty of crocodiles and hippos live freely. It is a must see spot if you visit the park. Madikwe Game Reserve is currently the fifth largest game reserve and is also one of the lesser known parks in South Africa, making it a hidden gem as it is regarded as one of the best conservation areas in Africa, offering the possibility to see the Big 5 in a park that spans only 680 square kilometres. The park offers a number of luxurious lodges as well as community lodges that organise safaris with expert guides in a malaria- free zone. And since visits to the reserve are reserved only for over-night visitors, a visit to this park feels even more unique and special. The government of Southafrica requires proof of yellow fever vaccination only if you are arriving from a country with risk of yellow fever.